Flag Retreat at WDW - Pixie & Pirate Destinations *|* Wishes become memories. One dream at a time. 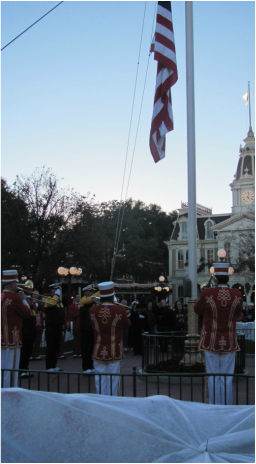 Since October 1, 1971, each day at 5 pm, the flag on Main Street USA is ceremoniously retired in a big way. Sadly, in all my years of visiting, I only saw this for the first time this past December. It’s a little known gem at Magic Kingdom and something I really wish I had seen sooner. For a little daily event, there is much pomp and circumstance. It all begins in the hours surrounding park opening when Cast Members silently search for an unsuspecting veteran who is chosen to be “Veteran of the Day.” How this person is chosen can vary and I found conflicting information on various sites on the internet, so I went to the one person I know who would have some personal insight in this – someone I introduced you to last week – my friend and fellow former Cast Member, Leslie. Since she had worked Main Street Operations on College Program, it made sense she would probably have been a part of this a time or two. Sure enough, I was right. _ But, back to the Flag Retreat. Once a veteran was chosen, they are asked to return to Town Square by 4:45 pm that day, where they will be given instructions. While it all seems to be an “event,” there is a very simple process. The band is spread out on and below the train platform. 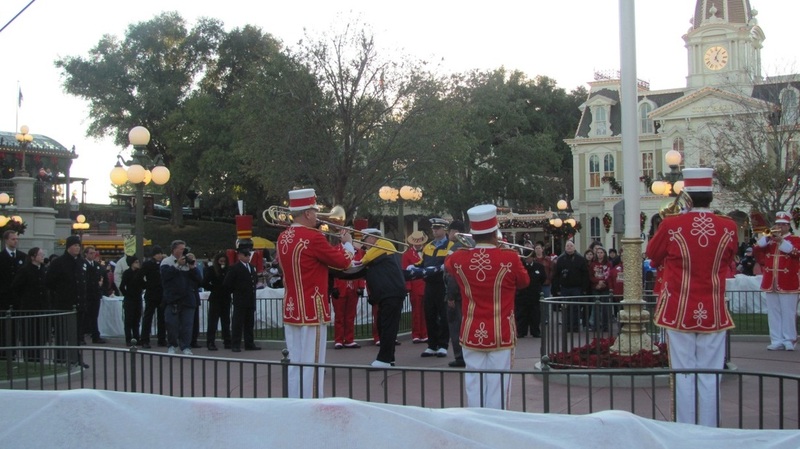 Cast Members form 2 lines facing each other and blocking the path to the flag pole. Next three members of Magic Kingdom Security Detail, along with the veteran join the line closest to the flag pole. The veteran’s family stands nearby with the Dapper Dans acapela group. 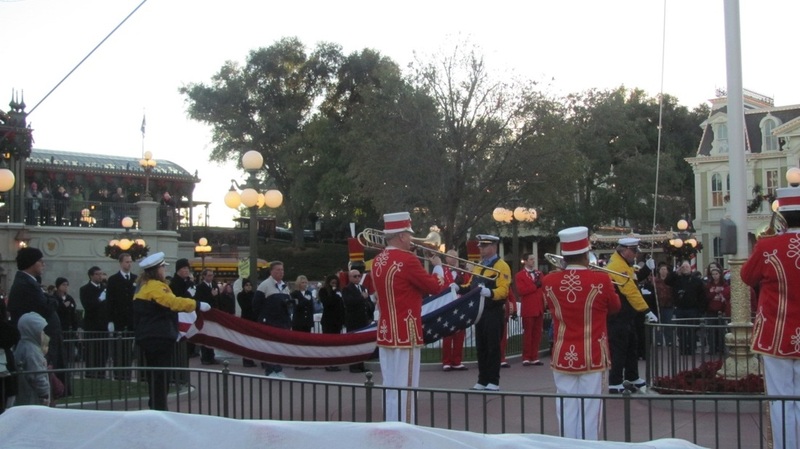 The band marches through the lines and the Cast Members follow, along with security and the veteran. At this point, the Pledge of Allegiance is said and a single trumpet sounds retreat. 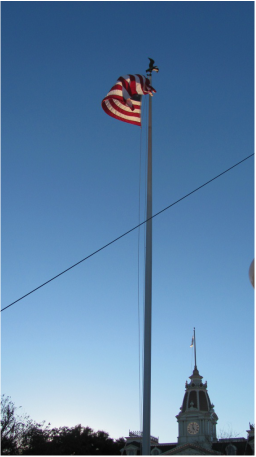 Next the flag is lowered as the band plays “The Star Spangled Banner”. _ At this point, security folds the flag as the Dapper Dans sing “God Bless America”. Once folded, the flag is presented to the veteran who is introduced to the crowd by name and hometown. Finally there is a short procession down Main Street along with an announcement to the crowd that this is the Honorary Veteran of the Day. He/she is presented with a Magical Moments certificate commemorating this along with a Veteran of the Day pin. Photopass photographers also capture the ceremony and the participant does receive a complimentary 8x10 along with the photos on the photopass card. _ So, it’s safe to say the experience is moving for all involved, from the vet, to the Cast Members, to the guests watching. I know it gave me chills (not just because it was 30-some degrees out that day) and brought tears to my eyes when we saw it in December. I highly recommend taking the 15 minutes out of your day to witness this at least once. You won’t regret it! Experience the Walt Disney World Flag Retreat in person - start planning your Disney vacation today!